The Revolvr is designed to allow you more options of placement, is slimmer than other follow focuses, and has a dual mountable arm, allowing you more space for other accessories. The conical handle matches the contours of your hand, even when the camera is hard to reach, and can be used on either side. The removable hard stops move independently, and you can use one or both. 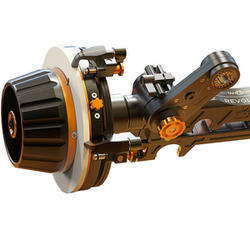 It uses a standard cine ratio so you instantly feel in control. The modular design also gives you the flexibility to work with stills lenses. The arms can be be mounted on either side. With the Revolvr, everything has been designed to be easy to access, and easy to use, even when it's cold. The clamps and locks can be used with gloves so you can keep your hands warm and protected. Incepted in the year 2007, Jaiswal Cine India is a largest and prominent rental house engaged in Renting & Supplying superior Services for Films equipments including Digital Film Cameras, Lenses, Wireless Lenses Control System, Easy Rigs, Steadicam, Clam Shell, Converters, Tiffen Filters, Follow Focus, Matte Box, Monitors, Shoulder Pads, Wireless Video Transmitter, Receivers and Zoom Control. We maintain the top brands collection of modern equipments to meet the best requirements of our clients. All our products are designed with new innovatory features which make them superior in performance, advanced in quality, consistent and highly sustainable.